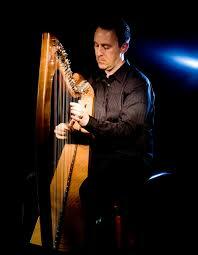 Michael Rooney never meant to become a harp player. By the age of ten the county Monaghan native was already proficient on the tin whistle, the fiddle, the piano and the concertina. He didn’t need another instrument vying for his attention. His father, however, had other ideas and, as Rooney mischievously tells the tale, it involved bribery and corruption. The end result of this child-minding was that Rooney himself came to like the harp and learned to play in tandem with his sister, although he quickly overtook her and became very adept. Not that he told anyone, least of all his school friends, and as he developed his other enthusiasm – Gaelic football – and got picked to play for the school team he was pretty sure that the last thing his team mates would have been impressed by was news of his musical accomplishment. In his teens, when he took his harp along to pub sessions Rooney could sense the musicians wincing. At Queen’s University in Belfast during the 1990s Rooney became seriously interested in composition. He’d already written tunes of his own in the traditional style while also competing in – and winning – harp championships. He went on to become senior All-Ireland champion and has won the prestigious Granard and Keadue harp competitions on several occasions. His first extended composition, The Famine Suite, made a suitable impression on its premiere in 1997, and Rooney has gone on to receive major commissions including music for an aerial dance spectacular, The Second Coming, a piece to mark the official visit to Sligo of The Prince of Wales and the Duchess of Cornwall in 2015, and The Macalla Suite, which celebrated the centenary of the Easter Rising this year. On the day we spoke Rooney had just been informed that he’d won the Composer of the Year title in the 2016 TG4 Gradam Ceoil awards – the Irish equivalent of the Scots Trad Music Awards - thanks to the Macalla Suite. He won’t, however, be giving up his day job as a school deputy principal just yet and he is looking forward immensely to playing at the Jimmy McHugh Memorial Concert and at the sessions that have grown around this event. As small town boy from Scotstown Rooney remembers coming over to Glasgow to visit the McHugh family – the McHugh sons, Brendan and Martin, are closer to him in age – and being introduced not just to the family house, where tunes seemed to be available on tap, but also to Sharkey’s Bar, Jimmy McHugh’s local where sessions still continue in his name. The Jimmy McHugh Memorial Concert takes place at Woodside Halls, Glasgow on Saturday, January 14.